Costa Rica and surfing go together like sunsets and ice cold beer, wouldn't you agree? Manuel Antonio surfing & watersports are an essential part of your Costa Rica vacation experience not to be missed! Manuel Antonio offers a nice long surf break perfect for those vacationers who want to learn to surf or enjoy paddle boarding and kayaking on a consistent wave. We have partnered up with a local surf legend from Manuel Antonio whose main concern is that you enjoy yourself to the fullest during your Costa Rica vacation! Our local bilingual guides are well-versed in about everything in the Manuel Antonio region, and will be sure to give you the tips you need to get up on that surf board. Experienced surfers have the option of just renting a board and hitting the local hot spots and surf to their hearts content. Whichever the case, The Real Deal Tours has the perfect Manuel Antonio surfing, paddle board, or kayak tour for you! Not into surfing? Not a problem! Enjoy one of the motorized watersports in Manuel Antonio such as parasailing, jet skis or banana boat rides from the beach. 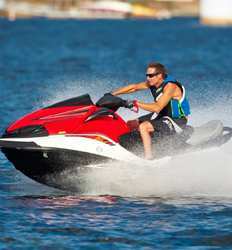 Surfing, parasailing, SUP, jet skis, banana boats and more; Manuel Antonio watersports has it all. 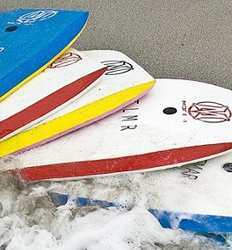 Below we have compiled a list of the Surfing & Watersports in Manuel Antonio & Quepos. Choose your favorite way to pass the day on Manuel Antonio beach! Dream of catching that perfect wave your entire life? Can you think of a better place to learn to surf in Costa Rica than on the shores outside of Manuel Antonio National Park? Even if you´ve never had the opportunity to surf, we guarantee you will be riding the waves like a champ after our expert surf instructors help you realize your dreams with our Manuel Antonio Surf Lessons. Manuel Antonio Surf Lessons deposit is $15.00 per person in a Public Tour and $15.00 per person in a Private Tour. If you have never tried Stand Up Paddle boarding before, Manuel Antonio is THE place to do it!! Manuel Antonio´s beautiful coastline is full of inlets and islands to discover. Calm waters and varied topography is what makes our Manuel Antonio SUP tour the perfect vessel to explore the region! With so many fun watersports in Manuel Antonio, why choose just one when you can try a whole bunch? Want to learn to surf in Costa Rica? Done! 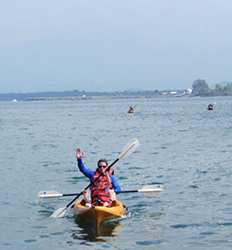 Love to paddle around the bay on your own SUP or kayak? We got that too! Prefer to boogie? Dive right in! Manuel Antonio Beach Break & Watersports Trio deposit is $11.00 per person. If you want the authentic Costa Rica surfing experience, then you've got to head for the road less traveled...which leads to hidden surf spots and stunning waterfalls! 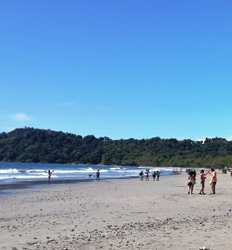 Our Manuel Antonio Beach Hopping Tour takes you into the heart of all that is the "Pura Vida" lifestyle in Costa Rica. Now, who's coming with us?? Manuel Antonio Beach Hopping & Surf Tour deposit is $15.00 per person in a Public Tour and $20.00 per person in a Private Tour. 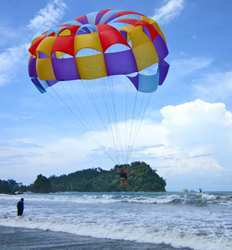 Parasailing in Costa Rica is always a treat, but parasailing in Manuel Antonio is out of this world!! Our Manuel Antonio Boat Parasail Tour offers unbeatable views of Manuel Antonio National park from the vantage point of 600' high....incredible!! One, two or three persons can share the ride, making a great opportunity for a family vacation memory. 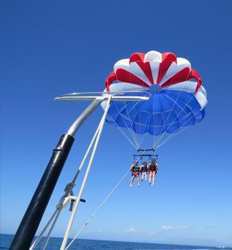 Manuel Antonio Boat Parasail Tour deposit is $10.00 per person in a group of up to 3 people. All by itself, the thrill of "flying" your own jet ski over warm Pacific waters off Manuel Antonio Beach is hard to resist. But this beautiful spot perfect for watersports makes renting a Jet Ski in Manuel Antonio a MUST do activity in Costa Rica! Laughs and splashes and great wet and wild fun are waiting for you on our Manuel Antonio Banana Boat Tour. Your travel mates or your whole family (up to seven people) can share the thrills and spills as you bounce over the warm Pacific waters! 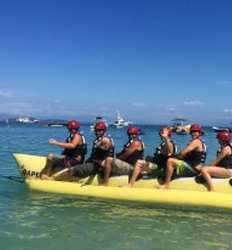 That’s right, this is a private banana boat tour in Manuel Antonio just for you and your friends! 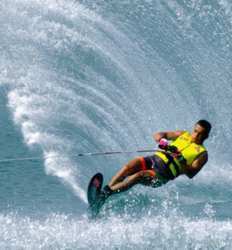 Wakeboarding & Water Skiing deposit is $10.00 per 30 minutes or $20.00 per 1 hour.